Your chance to win up to £25,000 and support our cause! 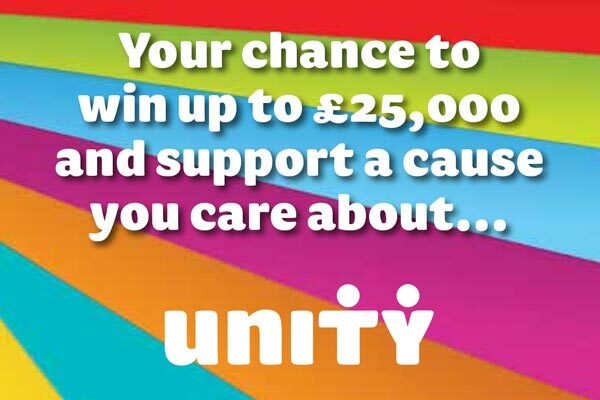 Every week you have the chance to win the £25,000 Unity jackpot plus many other fantastic cash prizes. At the same time, you’re helping us raise funds to support our work. The more people play the more money we recieve, so we need your support. For every £1 entry – at least 50p comes directly to us as profit. Play Now for Just £1! If you win, we’ll post a cheque directly to you, so there’s no need to check your numbers or claim your prize! Please note, you need to be 16 or over in order to play the LOD Unity Lottery.